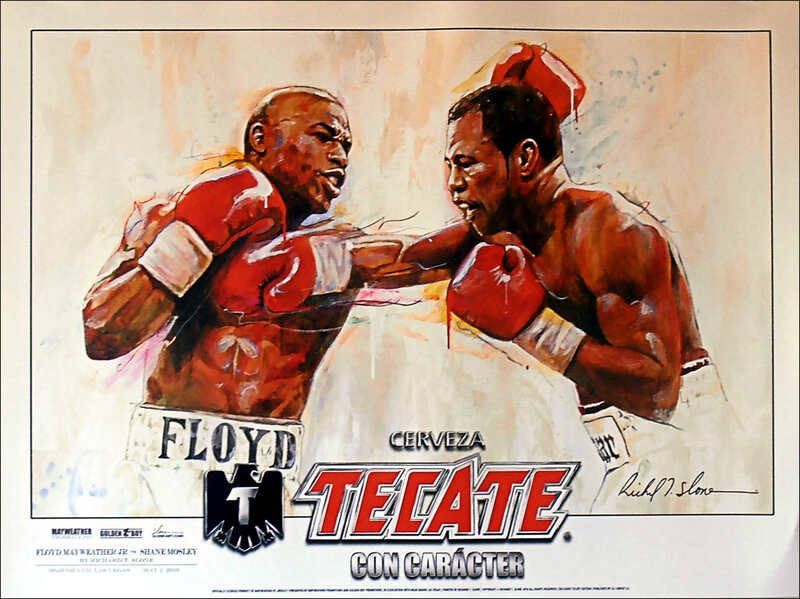 Description : Official Slone art limited edition MGM Grand commissioned(Tecate) onsite poster from the Mega Fight at the MGM Grand Garden Arena in Las Vegas. 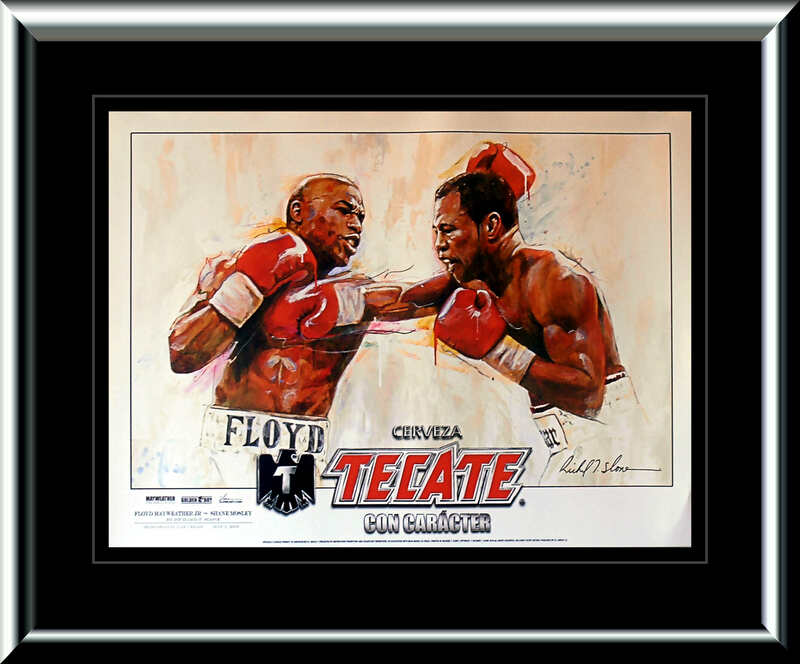 Fighting more aggressively than usual, Mayweather overcame a near knockdown in the second round Saturday night to dominate the rest of the way and win a lopsided 12-round decision over Shane Mosley in their welterweight showdown. 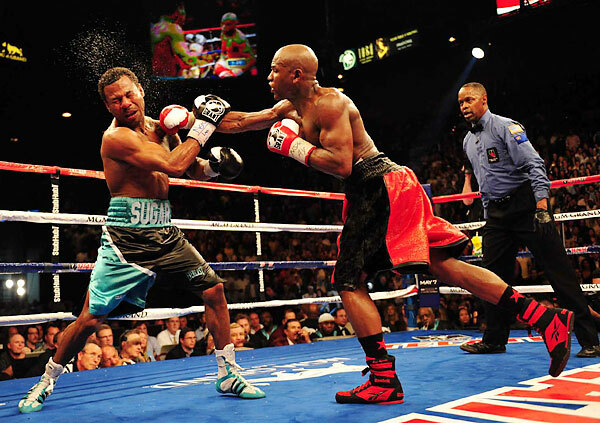 "I wanted to give the fans what they wanted to see, a toe-to-toe battle," Mayweather said. "It wasn't the same style for me but I wanted to be aggressive and I knew I could do it." Mayweather made Mosley look every bit his 38 years as he landed sharp punches to his head, dominating a fighter who had vowed to turn the bout into the fight of the decade. Mosley tried his best, but couldn't match the speed of the 33-year-old Mayweather, who grew more comfortable with each passing round.By the end of the night, Mayweather had put so many rounds in the bank that the only question was whether he would stop Mosley or be content to win a lopsided decision. Mayweather kept moving forward and continued to press the issue in a fight that wasn't in doubt. Two ringside judges scored it 119-109 for Mayweather, while the third had it 118-110. All had him winning every round past the second.